One of the hot tech topics of the moment is virtual reality, the idea that you can put on a headset and immerse yourself in something completely different. It has been a dream €“ at least of geeks €“ for many years now, but with the launch of the Oculus Rift, at what we were told was going to be an affordable price, it seemed that we might finally be getting somewhere. Well, the first issue is that the affordable price has already gone out of the window. Oculus Rift is $600 and the HTV Vive, its only real challenger, is $800. Not prices that will frighten the committed technophile, true, but not something that is going to build a mass market. So if you do not want to pay that, then there are cheaper alternatives. LG has launched a lightweight pair of glasses which it says is like "watching a 130" TV from two metres away". Which is not really virtual reality. And because they are not enclosed goggles like the market leaders, the real world spills in which sort of ruins the illusion. 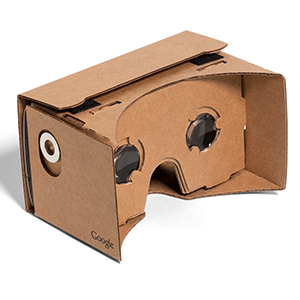 And at the bottom end of the market is Google Cardboard which is just that: a piece of folded cardboard which holds your smartphone just in front of your eyes. As the LG headset is also powered by an Android phone it suffers from the same problem: that there is not enough processing power in a phone to keep up with delivering two independent video windows with no lag. But I am not sure that is where the real issue lies, and which brings me back to the conversation I had with someone who thought VR was going to be the next big thing. I am not sure I know what VR is for. A few years ago Sir David Attenborough was the recipient of the IBC International Honour for Excellence, and I went to talk to him about it. At the time 3D was all the rage, and he had some sage things to say about it. And the prediction for the future was that it would be replaced by holographic videos which would leave the screen and perform in front of you, on your living room carpet. He said something that I thought then and think now is the most insightful and telling way of analysing new technology. "Yes," he said, "you can make an animal come out of your television screen and stand on your coffee table. But how are you going to tell a story?" That may have been a blinding statement of the bleeding obvious, but since that day I have approached all new technologies and developments with that key question. Will it help people tell stories? Because if not it is surely doomed. That is particularly true with virtual reality and the idea that you shoot in 360š, leaving the viewer to explore the scene. That is great if you want to explore a scene €“ find out what a hotel bedroom is going to look like, for example. But how do you use it to tell a story. Directors today know how to tell a story in film or video. They use light and shade, they use focus to draw our eyes to the key points of the action. How are we supposed to understand a story if we might have our backs to critical acts at critical times. Yes, I am sure that directors will come up with ways to focus our attention, to ensure we are looking at the right place at the right time. It is only a development of the visual language, after all. But if directors are still having to use the tricks of the trade to keep us looking in the right place, then what is the point in shooting all the rest of it. If we need a 120š field of view to keep our minds on the action, then why waste the bandwidth on the other 240š? And that is before we get to the other great imponderable. If we are shooting in the round, the full 360š, where does the crew stand? How do you hide the cables from the camera, not to mention the tripod it is standing on? How do you get a fluid, moving shot without seeing the Steadicam operator in the back of the field of view? Whether you go for smeary, laggy pictures from your phone in a cardboard holder or less smeary, less laggy pictures in a very expensive Oculus Rift, how do you immerse yourself in a story?